Is There A Distinction Between the Popular and the Literary in African Literature? Recently Chimamanda Adichie gave a talk in London, in connection with her book Americanah, in which she was asked about the distinction between literary and popular African fiction. She replied very quickly that she wasn’t particularly interested in these distinctions. Yet there has often been a sense in literature – especially amongst literary cognoscenti [particularly, from a western perspective] that to be literary is to be unpopular – or more relevantly that because you’re popular means you’re not serious. Even Contemporary African Literature was bedevilled by this. Notably, Amos Tutola, the pioneering Nigerian writer felt he was slighted and not taken seriously by the bright lights of African Literature because he wrote what was perceived to be a broken form of English. Nowadays, Tutola’s The Palm-Wine Drunkard, is a set text in universities all over the world and hailed as a literary work of brilliance, demonstrating the delicious violence his West African sensibility and narrative traditions brought to the novel as a literary form. Tutuola’s writing was rooted in the popular stories of his Yoruba heritage, and also benefitted from the long tradition of rough and ready writing in Nigeria during the colonial era; famously, Onitsha Market Literature was published by local presses, offering admonitions, advice, love stories, dilemmas – all brimming with the aspirations of the people who created them. Later on Cyprian Ekwensi’s writing captured some of the fervour for Africans migrating to the cities for the first time. Notably in Jagua Nana and People of the City, Ekwensi revealed the perils and thrills of the city for a particular class of African, whose advantages were found not in the newly founded universities, but in the popular life of the city, both legal and illicit. Published four years before Things Fall Apart, Ekwensi’s People of the City, is arguably as important as Achebe’s first novel, Things Fall Apart; its depiction of petit bourgeoisie and working class African lives, the degradations of the city, and the possibilities for love, are themes that contemporary African authors are now returning to and exploring with vigour - but Ekwensi did it first. Jagua Nana scandalised much of the Nigerian establishment with its frank description of the rise and fall of a prostitute. Ekwensi’s gift was perhaps in the verisimilitude and sheer energy of his stories, similar in many ways to that of Amos Tutuola in his works, which also appeared prior to Achebe’s. But Achebe’s emergence marked a literary coming of age, and though the ‘Father of African Literature’ accolade is increasingly decried as overblown, Achebe did bring a literary coolness, and mastery to African writing in English that was distinct from the popular forms Ekwensi and Tutola epitomised. The literary turn was significant, despite the convenience [and the snobbery] that valorised some African writers and not others – it coincided with the political decolonisation of the continent, it could certainly be seen as part of the same project; suddenly, the past was much more important than the present. Things Fall Apart made sense of the shattering of pre-colonial Africa just as post-colonial Africa was emerging, and it set a trend which many other writers followed, notably Okot P’Bitek with the Song of Lawino, Soyinka’s dramatic re-imaginings of the Yoruba past, through Greek myth, Duro Ladipo’s plays, Gabriel Okara’s The Voice, and Christopher Okigbo’s poetry inspired by the gods of his ancestral village, Idoto. This ‘literary’ turn was the tool for the fragile re-examination of the past; but soon enough, the urgency of the present re-asserted itself, and many of the writers who emerged in the de-colonisation period began to address the same themes of political corruption, and urban exploration and degradation that Ekwensi and others first explored in the 1950s. 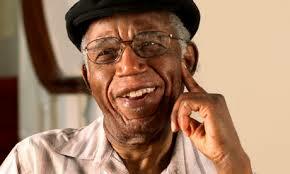 Ayi Kwei-Armah’s The Beautyful Ones are Not Yet Born, and Achebe’s No Longer at Ease being notable examples. The divide between the ‘literary’and the ‘popular’ collapsed definitively in the 1990s, and nowadays, it’s hard to suggest that there is a divide between ‘literary’ African writers and popular ones – just good ones and bad ones. Contemporary African novelists are thankfully not wringing their hands, worrying about which part of the fiction divide they fall into. Notably, Mukoma wa Ngugi, author of the crime thriller Nairobi Half-Life - and son of Ngugi wa Thiong’o - writes crime thrillers suffused with politics and urban concerns; Chimamanda Adichie’s latest novel, Americanah, brims with descriptions of popular life, yet both may endure as significant works of African literature. Increasingly, the separation between the literary and the popular in African literature appears false, which will hopefully translate into more readers for African writers, both at home and abroad. Dele Meiji Fatunla is Website Editor for the Royal African Society. He will be taking part in the RAS’ annual literature festival, Africa Writes, which takes place from 5 July – 7th July 2013.